There is nothing quite like the joy of seeing a proficient runner doing what seems like the most natural thing in the world. 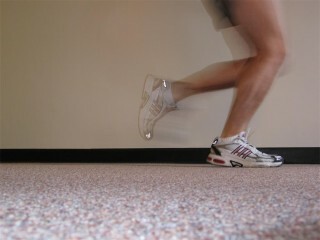 Running should be an elastic activity, where we use ourselves as biological springs. A good runner is able to do this. The vast majority of runners have never experienced this feeling, however – most of their awareness is taken up with the grind of repetitively overcoming gravity. There are many aspects to efficient, effective and enjoyable running, and perhaps the most fundamental is posture. Here’s the surprise though – it isn’t just the slumpy, slouch shouldered runner who has a posture problem. It is also the runner who is assuming the so-called “athletic posture” which is usually tense, straining upwards and with shoulders pinned back. Runners in all disciplines are often exhorted to “stay high”, but instead of generating this from the lower body, they create the impulse in their spine. Looking at them from the side, they actually appear to have their shoulders behind their hips as they try to “stay up”. This is running with the hand brake on. The stiff spine blocks the natural rotation which stores and releases elastic energy, so it diminishes efficiency. It also makes us work harder in our muscles as we start to have to push more to make up for this loss. This isn’t what a distance runner would want to hear. Having the shoulders wedged back makes it difficult for the muscles at the back of the hips to activate effectively, and affects how hard the hip flexors have to work. Many a sprinter complains of their tight hip flexors and strained hamstrings due to this effect. Runners, relax. Carry yourself lightly, rather than holding yourself up. All that extra tension is holding you back. For further tips and information on moving beautifully, check out our video page.